The Ojibwe Cultural Foundation invites you to walk and talk with Nanabush. Nish Tales: Walking and Talking with Nanabush is a language learning and story sharing site for kids and adults wishing to learn Ojibwe. Nanabush’s humorous escapades and great adventures have entertained generations of Anishnaabe and helped preserve our language. Nish Tales: Walking and Talking with Nanabush is a web site created to do the same. 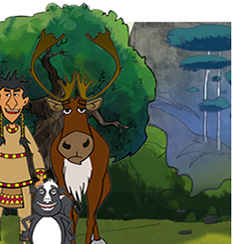 Here we use the humourous adventures of Nanabush to help people learn some basic Ojibwe. There are two Nanabush stories now on the site : The Power of the Skunk and Nanabush Loses the Meat. The stories are presented as animated clips, text and audio files . All media is in a bilingual format for reading, listening and watching. More entertaining stories of Nanabush and more language learning content will be added in the coming months. The Ojibwe Cultural Foundation is very interested in your opinion of Nish Tales: Walking and Talking with Nanabush. Your ideas will help this site grow and develop. If you’re interested in sharing your thoughts click on the Ojibwe Cultural Foundation link below. Migwetch. If you’re ready to walk and talk with Nanabush use the menu at the top. Nanabush could be selfish or generous; cowardly or brave; caring or spiteful; always curious and mischievous and often his own worst enemy. Sometimes he daringly saved the Anishinaabek, other times he caused them everlasting hardship. Nanabush walked all over Turtle Island. His many humorous escapades and great adventures explained the natural world, entertained generations of Anishnaabe and helped preserve the Ojibwe language. He remains an important figure in Anishnaabe culture. Nish Tales: Walking and Talking with Nanabush looks at the humourous and fun side of some of his adventures. Nanabush thinks hunting is too much work. So he spends a lot of time thinking of easy ways to find food. Nanabush decides that Zhigaak, with his skunk power, is the answer to his problems. He convinces Zhigaak to share his magical powers. Zhigaak tells Nanabush not to waste this special gift. But soon the woods is full of the sound of skunk power. When the time comes to hunt for food, Nanabush is in for an unpleasant surprise. There is no easy meal for the foolish and lazy. Nanabush decides to have a great feast, just for himself. His winter food will soon be gone. The wind rises and he hears a voice telling him to save his meat, it's a long cold winter. Nanabush does not listen to good advice. The wind, being the wind, does not let up and teases Nanabush for his foolishness. Nanabush decides to make the wind keep quiet. But even for a trickster that's hard to do and soon Nanabush is wanting to save his meat, because it is indeed a long cold winter.